With the Holidays fast approaching, there is no better time to share with you the progress on my current project with ISC-Audubon and its Chairman, Ron Dodson. As you might recall, a few months ago, this very worthy organization named me its official artist. As proud as I am of having received this title, I also know that it comes with responsibilities and dedication to its cause. As Official Conservation Artist, my major role is to create artwork that contributes in raising awareness for the ISC-Audubon, Conservation Landscapes for America Initiative, which is aimed at motivating people to become personally engaged in conservation and sustainability where they live, work, and play. The first undertaking was to create a collection of farm scenes for the book currently being produced. I spent most of the past year creating paintings that not only inspired my creativity but that were also representative of “farm life”. Proceeds from the sale of the soon to be released book and original works of art and products will benefit the ISC-Audubon “SEEDS Fund” that will be offering grants connected with sustainable agriculture efforts. To learn more about ISC-Audubon’s conseravation efforts in general, and this project in particular please visit http://www.isc-audubon.org/farms.html. I hope you will also become personally involved in this important undertaking. While working on this project however, I have not been able to create many other paintings. But as the Holidays are fast approaching, I thought you might like to see two of my most recent works. Hopefully they will remind you of warm days on streams and lakes even though snow is blanketing the ground. 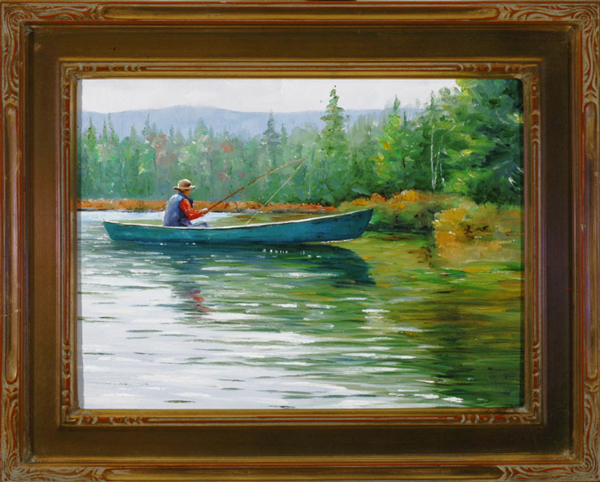 The first painting titled First Fish was inspired by one of my favorite fishing spots. It is a place of peace and tranquillity where the beauty of the surroundings is only surpassed by the fishing experience. 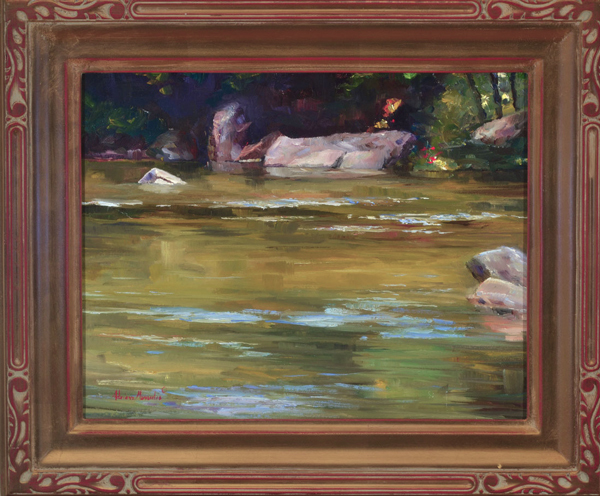 The 9″x12″ plein aire oil on panel comes framed in a custom made frame. The second painting Flowing Water is an intimate study of the small streams I so much love to fish and observe. This oil on panel measures 11″x14″ and comes framed in a custom made gold frame.